Humira reduces the effects of a substance (tumor necrosis factor alpha) in the body that can cause inflammation. Hate psoriasis? Love clearer skin. Plaque psoriasis can mean red, scaly skin which can have a real impact on you. But there is another option for some people with moderate to severe chronic plaque psoriasis. HUMIRA is a prescription medicine used to treat moderate to severe chronic (lasting a long time) plaque psoriasis in adults who are under the ongoing care of a physician, have the condition in many areas of their body, and who may benefit from taking injections or pills (systemic therapy) or phototherapy (treatment using ultraviolet light alone or with pills). When considering HUMIRA, your physician will determine if other systemic therapies are medically less appropriate. 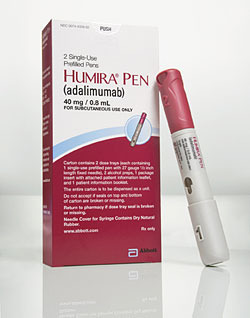 Humira was first approved for rheumatoid arthritis in 2003. Since then studies have been published showing that Humira can be successful in treating some psoriasis and psoriatic arthritis patients. Humira blocks tumor necrosis factor-alpha (TNF-alpha), a chemical "messenger" in the immune system that signals other cells to cause inflammation. There is too much TNF-alpha in the skin of people with psoriasis and the joints of people with certain types of arthritis. Patients should be screened for latent (hidden) tuberculosis (TB) before taking Humira, May reduce the progression of joint damage, Occasional blood tests are recommended.